On the heels of two critically acclaimed Duets albums, including last year's wildly popular Duets II, Tony Bennett now rounds out the trilogy with the Latin-themed Viva Duets. 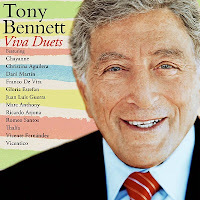 Following much the same format of its two predecessors, Viva Duets finds the 17-time-GRAMMY-winning legend collaborating with what he calls “a small army of the best performers that sing Spanish music,” including Marc Anthony, Thalía, Christina Aguilera, and Vicente Fernández, among others. While Bennett was familiar with a few of his latest guests prior to the project, with most others he admittedly was not. Still, Bennett says he was nonetheless impressed by everyone’s contributions and the chemistry they achieved together. 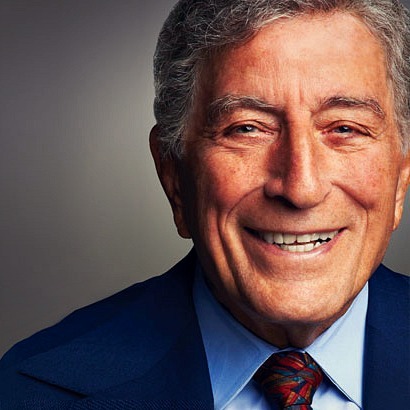 That’s high praise from an artist who for over 60 years has provided a veritable soundtrack for romance, his rich and intimate voice serving as a tonic for anyone with a beating heart, be it broken, unrequited, or in the throes of an all-consuming passion. I wonder if you feel a particular affinity toward Latin music considering you grew up listening to Italian music, which of course has a lot of passion as well. Absolutely. A long time ago, I realized that the bottom line — the actual truth of the whole situation — is that if the music hasn't got feeling it's actually boring. When there’s feeling, it’s meant. And if it’s meant, it’s forever. The Latino artists, they believe in melody and harmony. And the majority of them sing right from the heart. They look for good songs that they can sing that’ll last forever. The Viva Duets version of "The Way You Look Tonight" with Thalia is especially lovely, with how it’s given such an understated treatment. I love that song. Dorothy Fields wrote it, and it’s just the most beautiful song. People love it everywhere, not just in the Latin countries but internationally they love that song. 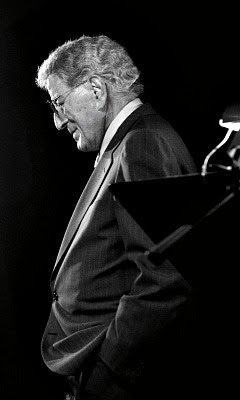 Since very early on in your career you’ve demonstrated an appreciation for well-written songs and great songwriters — Gershwin, Jerome Kern, Cole Porter. Where did that come from? I had a good education, and I learned that we’re such a young country. When you talk about France at the turn of the century, when there was the impressionistic period — where you had Ravel and Debussy and Tchaikovsky for music, and for painting you had Monet and Van Gogh and Manet and all the great painters — they were treated like they were scribblers. The critics just blasted them. They said, “These people are terrible!” Now we look at the impressionist paintings as some of the most glorious things that were ever done. Well, in our great country, it’s so young that we still don’t realize that we had our renaissance period-it was before my time-and it was in the ’20s and ’30s, when I was a little child. That was the beginning of talkies so they brought in Fred Astaire and Jimmy Cagney and great performers for film, and between the stage and films, the greatest songs. It was a renaissance period that will never be topped. You can’t get better than Gershwin. No one’s better than Cole Porter. Irving Berlin is America. Irving America Berlin, that should be his name; his middle name should be America. It was just the greatest period of songs. They’re never gonna die. They’re never gonna sound dated. They’re never gonna be old-fashioned. It’s not trash. You’re one of the few artists to have covered a Hank Williams song [“Cold Cold Heart”] while Hank Williams was still alive. Is it true that he called you after he heard your recording? He was joking, yeah. [Laughs] Actually I found out later on from his friends when I went to Nashville that he would always put my record on the jukebox. He would just listen to it all the time. He liked it so much. It’s often said about you that there is no complacency in how you approach your craft. You never take an audience for granted. You never take a song or live performance for granted. To what do you attribute that? Then, under the G.I. Bill of Rights, they allowed us to go to any school to get the education that we missed when we were on the line in Germany. I chose the American Theatre Wing, and because it was “The Good War” as they called it they gave us the best teachers. I had the best education of theatre, of dance, of singing, of learning how to memorize things. Each teacher was magnificent. All of them insisted on, “Never compromise. Only do quality. Stay with quality.” I took that advice and stayed with it and found that I was in verbal wars for the next twenty-five years [Laughs]. Because corporations were saying, “You’re not doing disco! You’re not doing rap! Why aren’t you with the times?” I’d say, “Well, I just do quality songs.” So I stayed that way and it all paid off. And I feel very satisfied with my life as a result.